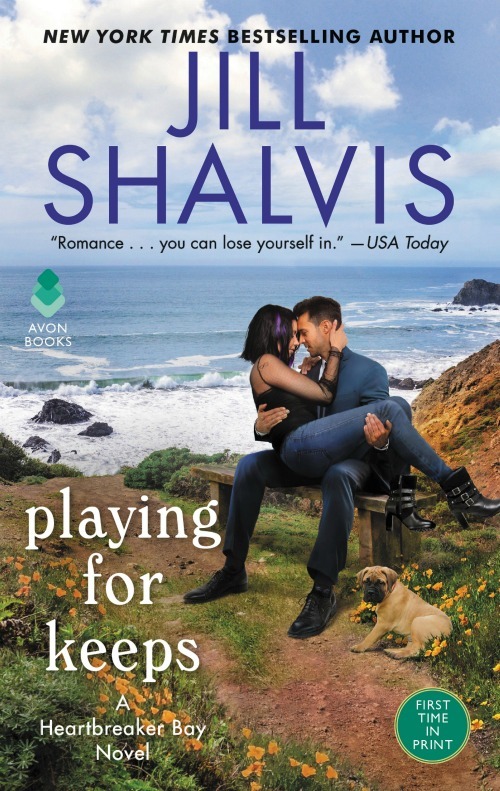 Reading a Jill Shalvis book is like a warm, cozy hug—a charming romance brimming with wit, warmth, heart and sexiness. Her next novel, PLAYING FOR KEEPS, is out tomorrow, but you can dive into it right now with this snippet from the book. The muffins were bite sized, meaning they were perfect. She pulled out what looked like a blueberry one and handed it to him. Happily, she thought, and popped it into her mouth, letting out a low moan of pleasure before she could stop herself. She reached into the bag and pulled out a poppy seed muffin next and held it out, ignoring the fact that his eyes had something new in them now. “I don’t like poppy seed either,” he said softly and watched her as she shrugged and popped that one in her mouth as well. When she tried to hand him a lemon muffin and he again shook his head, she finally caught on. “No. She’s scared.” Caleb pulled over and turned to face the back, reaching in to unhinge the crate. Lollipop immediately leapt at him. Once in his lap, she set her front paws on his chest and licked his face from chin to forehead. “Not we. You bought everything.” But Sadie wrapped her arms around Lollipop and tried to cuddle her in, but the dog’s eyes were on Caleb, as if maybe the sun rose and set on his broad shoulders. Reaching over, he patted her on the head – the dog, not Sadie – and started driving again. Soon as he did, Lollipop once again began whining and trying to get back into Caleb’s lap. Without taking his eyes off the road, he reached out to pet her again. This helped until he stopped touching her. Soon as he did, Lollipop held up a paw in his direction, like keep petting me! Caleb took her paw in his big hand and kept driving. While holding the dog’s paw. Lollipop relaxed, even smiled as she turned to the windshield in Sadie’s lap, now appearing to enjoy the ride. “Are you serious?” Sadie asked. “I meant you,” Sadie said. “Hey, she stopped crying, didn’t she? Do me a favor and shift into third gear when I ease into the clutch so I don’t have to let go of her hand. Huh. Over the past year or so since he’d first come into her orbit, she’d been amused by telling herself all sorts of stories about him. Things like he probably only dated supermodels, maybe even two at a time, and she bet he didn’t leave tips when he ate out, things like that. But the stories were starting to crumble beneath the weight of the truth. He was actually kind of a really good guy, one who fed people he thought needed feeding and risked an allergic reaction to rescue a scared, lonely, abandoned dog. She looked over at him, still holding Lollipop’s hand. “Funny, but I’m not whining, so…” she quipped with a teasing tone that was in complete contrast to the way her heart kicked hard at the thought of a physical connection to him. “You nervous about something?” he asked. “No. Why would I be nervous?” And how was he reading her at all? She had a world class poker face that she’d worked her entire life to perfect.